Immerse yourself in the craft of acting in the land of saints & scholars through a set of practical acting workshops and seminars carefully designed to place the writers in both a theatrical and literary context and to challenge, engage, empower and educate you in the rich world of Irish Theatre! The National Theatre School of Ireland (NTSI) – The Gaiety School of Acting has a proud and successful tradition of training actors who can bring a presence, an energy and a liveness to the stories we tell about ourselves. 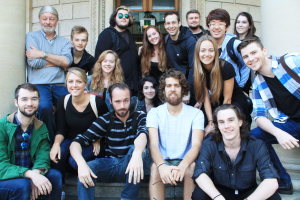 The Fall semester begins with a three-week intensive IES Abroad theatre course that combines performance workshops with the critical study of plays. This course, which takes place before the NTSI course begin, integrates your classroom work with Dublin’s annual Fringe Festival in September. You attend several performances at the festival and participate as a volunteer. After the festival, you fully enroll in a set of courses at the NTSI. The Spring semester begins in early January with courses at the NTSI, and an IES Abroad theatre course that focuses on the theatre of Northern Ireland, running consecutively. NTSI coursework ends in late March. The IES Abroad course then continues on until mid-April, culminating in a performance project. The academic experience at the NTSI is unique because you follow a set curriculum, which all first-year students at the school complete. However, as the standard program at the NTSI is comprised of only two years, the courses in the first-year track are equivalent to intermediate courses. A variety of topics are explored in each discipline. Find out more here.